This intimate theatre was built on the site of the old Albion Tavern, and opened in November 1924. The beginnings of the Fortune Theatre were anything but fortunate. The opening play, %u2018Sinners%u2019 by Laurence Cowen, closed after two weeks. 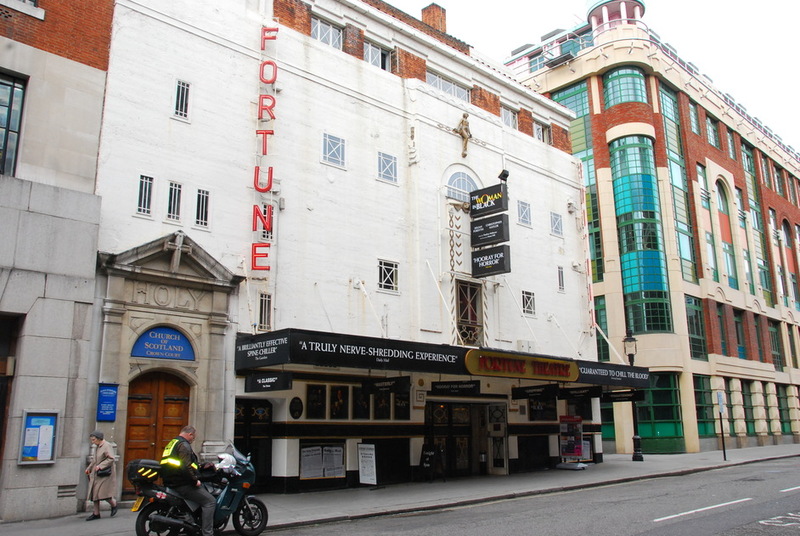 Over the next few decades, the Fortune Theatre had to resort to showing amateur plays and during World War II the venue was used by ENSA, the concert party corps of the Forces. But in the 1960s the theatre%u2019s fortunes began to change. Beyond the Fringe (1961) was shown at the Fortune Theatre, and it was a massive success, launching the careers of Peter Cook, Dudley Moore, Jonathan Miller and Alan Bennett. Its other blockbuster hit has been Stephen Mallatratt%u2019s The Woman in Black (1989), which has been performed (over 5000 times) at the theatre ever since. Robin Herford directs Stephen Mallatratt's stage adaptation of Susan Hill's creepy novel about an emotionally scarred lawyer obsessed with the idea of a family curse. The production stars Richard Hope and Mark Hawkins. Each day, an all-star cast improvise a brand new Austen work based on audience suggestions. Full of swooning ladies, stolen looks and dashing gents. What are the best dining options near Fortune Theatre London? Fortune Theatre gyms, sporting activities, health & beauty and fitness. The best pubs near London Fortune Theatre. Fortune Theatre clubs, bars, cabaret nights, casinos and interesting nightlife. Where to have your meeting, conference, exhibition, private dining or training course near Fortune Theatre. From cheap budget places to stay to luxury 5 star hotels see our deals for Fortune Theatre hotels, including The Waldorf Hilton Hotel London from 76% off.